Premium Compatible Label Tapes for the Brother P-Touch 1230PC printer. Brother P-Touch 1230PC is a portable PC connectable label printing machine. The label maker can be connected to computer system without any software installation. A USB chord is all one needs to connect this handheld device with any PC. To print labels, type on the computer keyboard and preview on screen. Brother P-Touch 1230PC is compatible with Windows 2000, XP, and Vista. Once the print is done, disconnect it from PC without leaving behind any software. 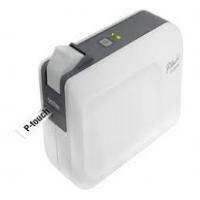 Brother P-Touch 1230PC is chargeable with 6AAA batteries and an adapter. Batteries and adapter have to be purchased separately. Brother P-Touch 1230PC Label Tapes are laminated and non-laminated types. They are water, chemical, fade and temperature resistant. They can be printed in 3.5,6,9, 12 width. One can print multiple lines, frames, symbols and graphics, and manage the length of symbols. For printing barcodes, one has to download P-Touch editor 5.0 on the system from company’s website. Some extra fonts and features are also provided with the editor. The print speed resolution is 180 dpi and printing speed is 12mm per second. The printer weighs about 410 grams and come in white and grey color. The unit comes with a user guide, Tze laminated 5 meter label tape and USB cable. In order to save power, the device shuts down on its own after twenty minutes of no usage. Brother P-Touch 1230PC is a lightweight, portable device suitable for printing professional looking labels at any given place. The strong durable Tze laminated tapes are perfect fit for labelling any object indoor and outdoor, can print address, contact details, phone numbers and barcodes. Inbuilt software in the labelling device give a hassle free connectivity with a PC without any installation in PC. Q. Why does an application error occur when I try to use the database function to create labels with Brother P-Touch 1230PC? A. This problem might occur when the database module operated by the P-touch Editor is damaged or the database engine version installed is not updated. To overcome the problem, please install the latest updated version of Microsoft Data Access Components (MDAC) and Microsoft Jet 4.0 database engine from Microsoft download center. Q. I am not able to select Brother P-Touch 1230PC label tape width. Instead, only standard paper sizes are selected for the P-Touch Editor 5.1. For your information, I use a Windows OS. What should I do? Would you please suggest a solution? Thanks! A. Definitely. At the outset, please ensure that the printer driver for the printer you use is installed. Because, if the P-Touch Editor is installed directly through the website, then the P-Touch Editor and the printer driver are two separate files - you need to install both P-Touch Editor and printer driver separately. Another reason may be that the printer you use is not the default printer for P-Touch Editor. Hence to resolve the issue please open P-Touch Editor, select ‘File’ option and then click on the ‘Printer/Page Setup’ option from the list to open the Printer Setup dialog box. In the dialog box check if your printer is selected or not. If it is not selected, please select your printer model and click on ‘Save Current Selection’ button located below. Please note that if your printer name is not specified in the list, it means the printer driver has not been installed properly. In that case, you will have to download and install the printer driver again. Q. Does Brother P-Touch 1230PC have the facility to print alphabets in Latin? I would like to use Brother P-Touch 1230PC label tapes to create labels with the variety of fonts. So, will this printer provide this option? A. Yes. If you connect your printer to a computer, you will be able to use Brother P-Touch 1230PC label tapes to create labels with all fonts that are available on the computer. Q. Though Brother P-Touch 1230PC machine is a useful versatile printer it wastes a lot of tapes which is really annoying. I know there is a way to stop the wastage when creating multiple labels. But don’t you have a solution to stop the wastage when printing just one or two labels? This printer has made me waste too many Brother P-Touch 1230PC label tapes unnecessarily. Can you provide a solution please? A. Thank you for the question. We would really be happy to help you if we had the solution to stop the wastage of Brother P-Touch 1230PC label tapes. Unfortunately, every machine operates with a mechanism which compels the printer’s system to use tapes at the beginning and the end of the very first label printed - every label printer works with the same mechanism. Thus, there is no other way to stop the excessive use of labels until you use more than one label continuously. But you could always leave suggestions and feedback with every brand to improve the way electronics work. Q. I have been using Brother P-Touch 1230PC label tapes in labeling the plants in my garden. They have always worked great. But will the same label tapes be useful in labeling things kept in freezer? A. Yes. You can use Brother P-Touch 1230PC laminated label tapes in labeling things stored in a freezer. The laminated labels are sturdy and long-lasting and at the same time also resistant to water, chemicals, and extreme temperatures.